I try a LOT of different skincare products - moisturizers, exfoliants, toners; you name it and I've likely tried it or have it on my list. There's some things that have become "holy grail" products, some that I've hated and some that I like but could live without - and I love trying them! If there's one thing I expect and absolutely NEED from a skincare product, it's to have my face feeling fresh and clean after using it. If not, I know it's something I'll never use again. Enter the Clarisonic Mia 2. Obsessed, guys!! I started using the Mia 2 by using it for 7 days straight and since the very first day of using it my skin has felt amazing! I've never really (thankfully) had a problem with my skin, but in the cooler weather especially my face gets dry and I've always had the problem of T-zone oiliness throughout the day. It drives me crazy and I've tried so many things for it - I carry around blotting papers because I hate the feeling of my face being shiny! I think it's much more of something only I realize because my sister tells me ALL the time that it really never is as bad as I make it seem, but it still makes me self conscious. I use the Mia 2 every single night and it's something I look forward to all day long haha - no better feeling than taking your makeup off and cleansing your face of dirt, germs and leftover makeup! 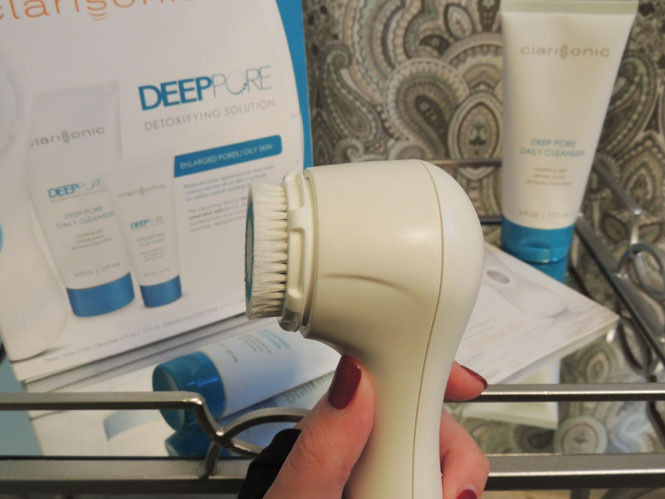 The Clarisonic Mia 2 uses a gentle, sonic micro-massage to deeply cleanse your skin. It has two different speeds and you can easily customize how you use it on your face to give you the BEST facial cleanse you've ever tried, seriously. It also has a T-timer, which is meant to help time your cleanse so that every inch of your face gets an even, cleansing feel to it. This timer is SO cool because it starts to slow down/pause when it's time to move to another part of your face! This thing is so smart it's sort of crazy; for reference I use the Mia 2 on my forehead and nose/chin for 20 seconds each and on my cheeks for 10 seconds each. So it literally takes just over a minute to have your skin feeling so clear and fresh! The Deep Pore Daily Cleanser is meant to help remove any impurities and leftover makeup/dirt from your face. It *also* helps remove excess oils - score for me!! I put a couple of drops right onto the Mia 2 and start cleansing away! I use this Detoxifying Clay Mask twice a week to help clean and relieve my pores and so far, SO good! I've used it three times since receiving it, and I love the way it feels on my skin. The coolest part is after having it on your skin, you can remove the mask using the Mia 2! It's such a refreshing feeling and helps to decongest your pores. I look forward to the two times a week I include this in my skin routine because it's such a good feeling! 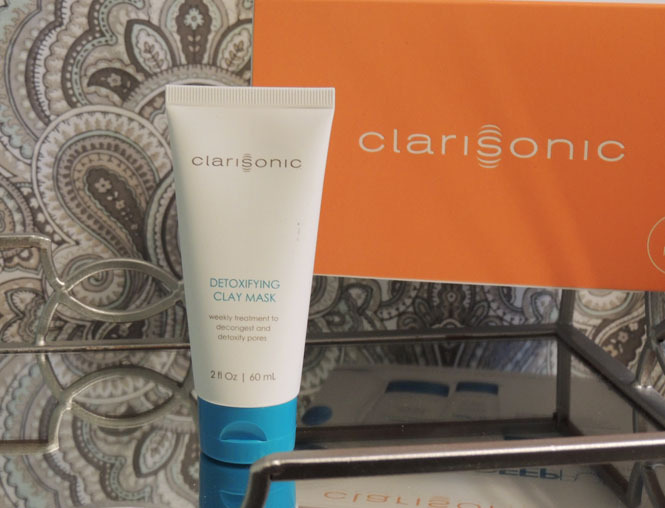 This Clarisonic Deep Pore Detoxifying Solution is the best little kit ever. 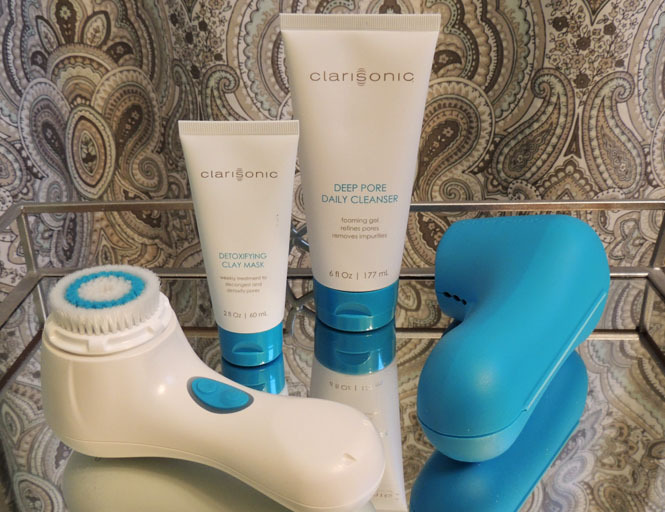 I've always been a Clarisonic fan and I'm so happy to have the Mia 2 as a part of my skincare routine now! It even comes with this travel case and it's SO easy to travel around with. I have some skincare products that are too big, bulky or heavy to travel with but the Mia 2 is the perfect size and the case makes traveling with it in your beauty bag seamless. With a device that feels so soothing and gentle on your skin, trust me you'll be wanting this to go everywhere with you. If you've been needing a new skincare product to love or need some skin-detoxifying solutions in your life, I highly recommend the Mia 2! What's your favorite skincare product? This is a sponsored post in partnership with Clarisonic and Her Campus Media. All words and opinions as always are my own. I love the mia 2! I have had mine almost 2 years. If I happen to stop using it I can definitely tell a difference. I love the Mia 2 as well! I love the way my skin feels after I use it. I have started to test out using it with different facial washes recently. I love my clarisonic too! It just helps my face feel so fresh, especially after a long day! Why does everyone have one but me?! Trying to get one soon :) thanks for the review! I've considered purchasing this for a while so your review came at a good time. Thanks so much! I adore mine too! It has helped clear up my skin so much. I've never tried the clarisonic before, but now I think I'll add it to my wishlist for the holidays! Thank you for sharing! I LOVE my Clairsonic, and whenever I wash my face without it, it just doesn't feel clean! I need to try the Detoxifying Deep Pore Cleanser! Thanks for the info! That sounds amazing. I've never tried any products like this before. I wouldn't mind giving this a try! I've heard such good things about Clairsonic. Definitely going to have to give it a try! I tend to have a bit of a dry, flaky facial skin problem. I'll bet this would solve that. I love Clarisonic but I don't think I've tried their cleansers. I'll have to now! Also, jealous over that super cute case! I need this! I have been wanting to get this for awhile now. Now, I definitely think I will! Lovelovelove my Clarisonic...it's now a total must have in my skincare routine. I use mine every single night!! Wow, I would like to buy one. Perfect for my skin care routine. Oh, I haven't tried anything like that. Looks so useful! I had a soniclear system, but it broke after a few too many slips in the shower. I've been on the look out for a new cleansing system and am considering the clarisonic. Looks like some great products. I would love to give this a try! Sounds like it would make a great skin care routine for me! I love my clarisonic! The mia sounds amazing. I think it may be time for an upgrade. I love taking care of my skin and it would be nice to have one of these. I've used a similar scrub and it's been really good with my skin. This sounds like it has more features. Isnt mia 2 great ! I love it too . Thanks for sharing your experience , Looking forward to your next one . This really looks good to carry anywhere. My friend will really like this set as an early Xmas present. To be honest nothing can be better than this. I have used this cream and it make my skin look fresh. Also, to restore the freshness of my skin prefer revitol hair removal cream to get rid off ingrown hairs as well as to restore freshness. Skin is the largest organ of your entire body, but many of us spend less time caring for it than we do washing our hair. Considering how important our skin is. Very informative topic. I have too sensitive skin and easily prone to allergic reactions. The skin care cream I'm using these days is best for my skin and is a complete solution for the sensitive skin problems. If this product is good for sensitive skin then I would love to buy it. Use lifecell anti aging skin cream that are good for your skin.